My husband is the writer in the family and my chief editor. He has a beautiful way with words and an astounding ability to create whole worlds on paper.When I read one of hisstories,I am raised to another plane, given the chance to look at the world in a new way. When I am at a loss for what to say here on Gathering Flavors, I turn to Al who never fails to give me great advice. His wisdom is always right on, seemingly simple, but complex in its message. Today he reminded me that I can write about anything I want to write about. It’s a freedom, not a luxury. Writing is a creative process. Be creative, he said. Connect with others through your words. Today I can think of more things I don’t want to write about than ones that I do. It is September 11, the anniversary of the attacks on the twin towers. I don’t want to write about that because I don’t want to remember the loss and destruction of that day, the fear. I don’t want to remember the worry I experienced about my family in Manhattan. Were they safe? Where could they go for refuge? Why can’t I get through to them on the phone? Fortunate that they were not harmed, fortunate that our family business was intact, I know that event changed forever how they live on that tiny island. Security is different. Some still have nightmares about what happened but they stay to go on with their work, stay to raise their families in a place that is full of optimism despite what happened. New York is a better place than it was 12 years ago, the new Freedom Tower a new symbol of the hope and strength it takes to be human. September 11 is a reminder of what a complicated world we live in, a good back-drop to the questions we face now as a country about Syria. How can we not help when we know others are suffering? How do we help? I wish I had the answer. So, here I write using my creative juices to ponder and connect. What a wonderful freedom. On the lighter side of life, with the weather turning suddenly cooler, it’s a little harder to get out of bed on chilly mornings. So, I find myself thinking about hot breakfasts to create and share with my family. These Muffins with Oatmeal, Peaches, Kiwi and Ginger are an elegant way to transition to fall eating. Like eating a bowl of oatmeal in a muffin, delicate and moist, these pastries are lightly sweetened with both brown sugar and the natural flavors of the fruits. A crumb topping gives a crunchy texture to the otherwise smooth and soft delicacy. Try them with hot coffee and steamed milk for a refreshing way to start the day. Always grateful to you, dear readers, for taking the time to visit Gathering Flavors. I am glad I wrote this. Preheat oven to 350 degrees F. Line a 12-cup muffin pan with cupcake liners. In a small bowl, mix together the topping ingredients, using your fingers to blend the butter into the dry ingredients. Set aside in the refrigerator to keep the butter chilled while you continue with the recipe. In a large bowl or in the bowl of a standing mixer, cream together the brown sugar and butter. Beat in the eggs, one at a time, until they are each fully incorporated. Add the Greek yogurt, cream or half and half, and vanilla extract. Beat to combine. Add the sifted dry ingredients and mix in with the wet—gently—just until combined. In a small bowl, toss the peach and kiwi chunks with the tablespoon all-purpose flour. Add the fruit the to batter and mix in gently to distribute the fruit throughout the batter. Divide the batter evenly in the prepared muffin pan. Distribute the prepared topping evenly as well. Bake until the tops are golden and a cake tester comes out clean when inserted in the center of a muffin, about 25 minutes. Steel-cut oats are whole grain oats that have been cut into pieces. They give a nice texture to these muffins. Using the quick version in this recipe eliminates the need to soak the oats ahead of time. If you do not have steel-cut oats, substitute an equal amount of traditional quick oats. The total amount of cut fruit for this recipe should equal one cup when cut up. Substitute any of your favorite fresh, seasonal fruits for the kiwi and peaches. You can use any large muffin or cupcake cup to make these. I baked them in tulip cups because the shape of the cups holds the topping nicely. Tulip cups can be purchased atKing Arthur Flour. 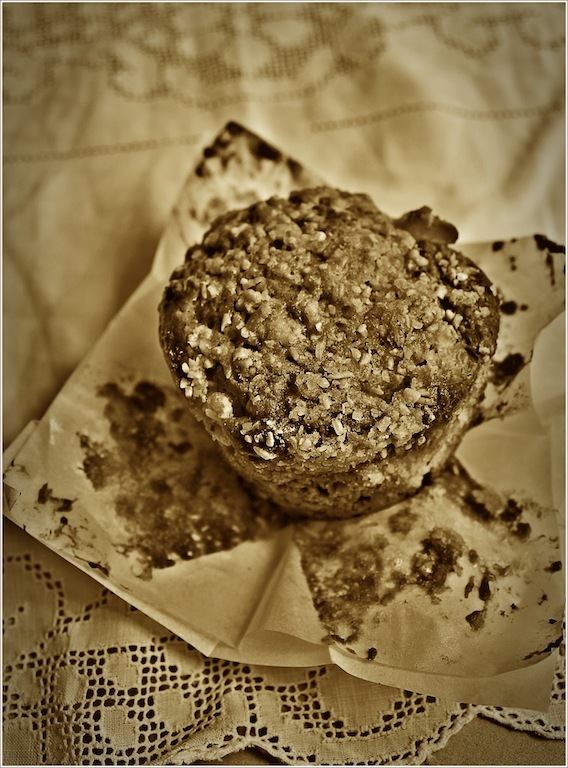 If you do not eat these right away, allow the muffins to cool completely and store in an airtight container. They will be best if eaten with 24 hours after baking.